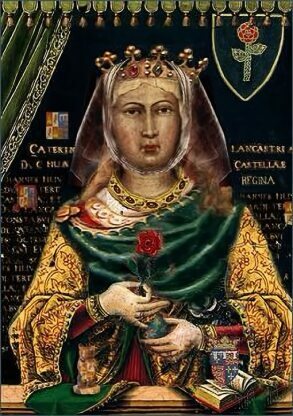 Catherine of Lancaster, Queen of Castile. Catherine of Lancaster was born on 31 March 1373 at Hertford Castle, she was the daughter of John of Gaunt, Duke of Lancaster (third surviving son of Edward III and Philippa of Hainault) and and his second wife, Constance of Castile (the daughter of King Pedro 'the Cruel' of Castile and María de Padilla. John of Gaunt and Constance also had a son John (1374-1375), who died in infancy. Catherine was said to be of a fair complexion, with blue eyes, her hair color was between reddish-blonde and auburn. 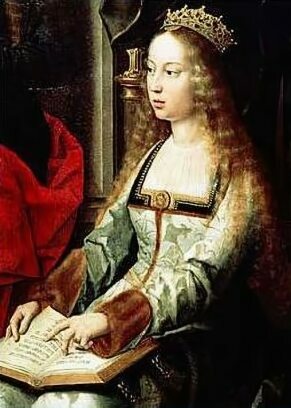 Catherine's mother, Constance of Castile was the eldest daughter and heiress of her father King Pedro of Castile, who had no son to succeed him. 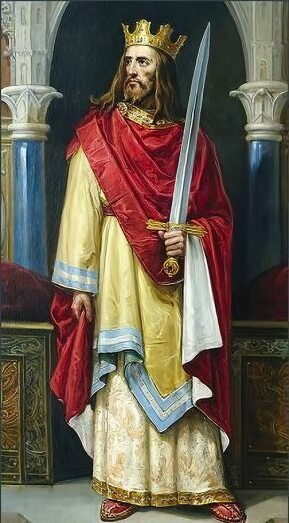 Pedro had been killed by his half brother Henry of Trastamara, illegitimate son of King Alfonso XI of Castile, who then asumed the throne of Castile as King Henry II. John of Gaunt assumed the title of King of Castile and León in right of his wife and impaled his arms with those of Castile. Henry II of Castile died on 29 May 1379 and was succeeded by his son John I to the Castilian throne. John of Gaunt had considered several schemes to launch an invasion of Castile to press his claim to the Castilian throne, but it was until 1386, after he had formed an alliance with John I of Portugal, that he was able to land with an army in the Iberian Peninsula. John of Gaunt and Constance set sail from England on 9 July 1386 with a large Anglo-Portuguese fleet and landed at Corunna in northern Spain on 29 July. The thirteen year old Catherine accompanied her parents to Spain. From August to October, John of Gaunt established a court and chancery at Ourense and received the submission of the Galician nobility and most of the towns of Galicia. Gaunt had hoped for an early and decisive battle, the Castilians, however, were in no hurry to meet him in battle, and as a result he experienced difficulties in paying his army. In November he met John I of Portugal where they reached agreement to launch an Anglo-Portuguese invasion of central Castile early in 1387. Their arrangement was sealed through the marriage of Phillipa of Lancaster, his daughter by his first marriage to Blanche of Lancaster, to King John I. Many of Gaunt's soldiers, however, had succumbed to illness, so when the invasion of Castile was mounted the English were greatly outnumbered by their Portuguese allies. The campaign, which took place from April to June of 1387 met with failure. The Castilians refused to give battle to Gaunt, while the Anglo-Portuguese army was harried by the French mercenaries of John of Castile. Many of the English died of disease or exhaustion, while others, disillusioned, deserted his army. Gaunt then decided to accept the proposal of King John I of Castile, to bring an end to their conflict through the marriage of Catherine to King John's son, Prince Henry. As part of their agreement, Constance, Duchess of Lancaster, should renounce her claim to the throne of Castile and Catherine included in her a dower of the towns of Soria, Almazán, Atienza, Deza, and Molina. A final treaty in regards to this proposal was ratified at Bayonne in Gascony on 8 July 1388. (3) John II, King of Castile (1405-1454). On the death of Henry III in 1406, by the terms of his will, his widow, Catherine, and his brother, the Infante Ferdinand of Aragon became joint regents during the minority of her son, John II, who was then under two years old. The custody of the young king was given to two nobles, Diego López de Stúñiga and Juan Fernandez de Velasco. Catherine, however was not willing to relinquish her young son to their care and made preparations to defend herself at the castle of the Alcázar of Segovia. Ferdinand negotiated for Catherine to retain custody of John. Differences of opinion between the two regents resulted in the division of the territories each ruled. On the death of Ferdinand's maternal uncle, King Martin I of Aragon without an heir, Ferdinand succeeded to the throne of the Kingdom of Aragon in 1412, although he continued to act as co-regent of Castile for his young nephew. On his death in 1416, Catherine became the sole regent of Castile. Catherine improved relations with England, which had been ruled by her half-brother Henry IV since 1399, Catherine and Henry encouraged trade between Castile and England. Relations with Portugal, were her half sister Phillipa was Queen Consort, were also similarly improved. She also contributed to end the Western Schism by recognizing Pope Martin V.
The death of Ferdinand succeeded in reducing Catherine's power, as she found his enemies no longer felt the need to support her. Having suffered a stroke, she relinquished the custody of her son the king. Catherine had gained much weight and became obese, she also developed gout and other related health problems. An account survives of Catherine during her last years, written by Fernán Pérez de Guzmán. It states that she was a sickly woman. He describes her as being very tall for a woman and fat, her complexion was fair, de Guzmán also states that her movements were similar to those of a man. When Ferdinand died in 1416, Catherine's authority was reduced, because his rivals no longer supported her. Catherine, unwell due to a stroke she had suffered , relinquished the custody of her son John. Queen Catherine died at Valladolid on 2 June 1418, of a further stroke, at the age of 45 and was buried with her husband in the Capilla de los Reyes Nuevos in Cathedral of Toledo where her effigy can be seen. Her son John II married (as his second wife) Isabella of Portugal, the granddaughter of Catherine's half sister Phillipa of Lancaster and became the father of Isabella, Queen of Castile in her own right. Isabella in turn was the mother of Catherine of Aragon, who became first wife of of King Henry VIII of England, who was named after her great-grandmother.